Cicada killers may look very imposing because of their large size, but unlike other wasps they rarely sting humans unless they are provoked or threatened. Male cicada killers don’t even have stingers! They are black and yellow in color and have orange-brown legs. Cicada killers are solitary wasps, so each female cicada killer will make her own burrow in either bare ground or sparse grass to lay her eggs. They eat flower nectar as adults, but the females hunt and paralyze cicadas to provide food for the immature cicada killers over the Winter. Cicada killers will often return to the same places year after year because the conditions are favorable. Cicada killers are looking for cicada populations to feed on. If you have cicadas living in the bushes around your home, cicada killers will likely follow. Cicada killers are attracted to sparse lawns and bare, dry soil, so they will make nests on your property in areas that fit these criteria. Their nests are dug into the ground in areas such as along sidewalks, on your lawn, within flower beds, and in gardens. Their tunnels serve the purpose of laying larvae and dragging cicadas down to feed on. Why should I be concerned with Cicada Killers? 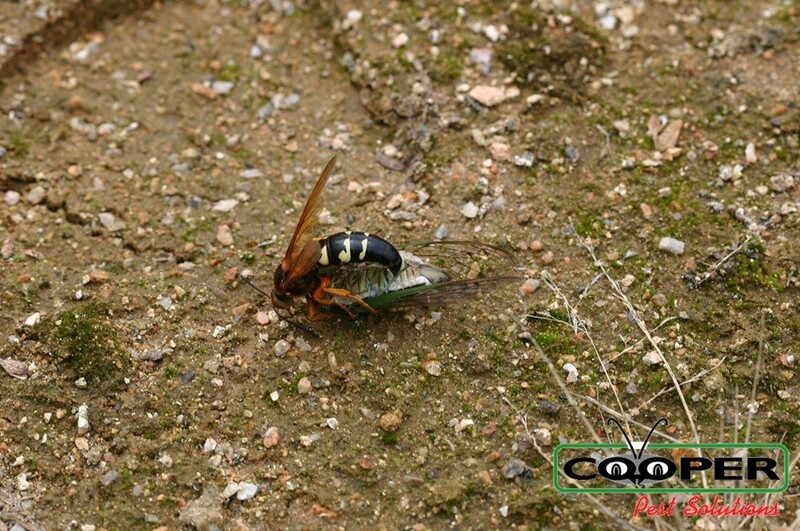 Cicada killers are beneficial insects and in most instances will not sting humans. They can cause a small bit of damage to lawns and flowerbeds where their burrows leave small mounds of dirt and holes up to 1 inch in diameter. In general, cicada killers are good insects to have around because they reduce the cicada population, which results in less plant damage. However, they look very intimidating and the males can seem aggressive despite the fact that they cannot sting. Their stinger is solely used to paralyze their prey. Due to their frightening appearance, many people do not want them on their property. It is difficult to completely eliminate cicada killer activity, but chemical treatments to their holes will help to reduce the activity of the females. Having a dense lawn and dense coverage in planters, in addition to letting grass grow a bit taller in July and August will help deter cicada killers. Maintain a dense lawn and planters with little or no bare ground and allow grass to grow a bit longer in the mid to late summer. This will make your property less desirable as a location for female cicada killers to burrow. How can I prevent Cicada Killers in the future? The best way to prevent cicada killers is to have a well-maintained lawn with no areas of bare soil since it is bare soil that is attractive to cicada killers. Allowing your lawn to grow a bit longer in July and August will also help to deter cicada killers. Our skilled technicians can treat the holes where the cicada killers have laid their eggs to reduce the activity of the female cicada killers. However, this treatment will not stop male cicada killers from flying in the area. This service is a one time service and the service has no additional service calls attached. Please call our office for details. At Cooper Pest Solutions, our goal is to provide fast, convenient service, with the peace of mind that you are in good hands. We understand that pest problems can be stressful and overwhelming. That's why our goal is to provide same day or next day service. There are many eco-friendly options available for cicada killer control. 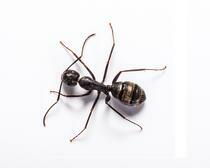 In addition, all products used by Cooper Pest Solutions are EPA registered for pest control use. Our highly trained pest control professionals will follow all appropriate label requirements in an effort to keep pets and humans safe. Call us at 1-800-949-2667 or fill out our contact form on this page for more information and to scheduled service.